Braamfontein – Page 2 – Write. Snap. Click. Thokwadi Seabela had left out mince to defrost. It was 8pm and after a long day at the UJ Law Clinic, she was looking forward to a nice hot meal. But when she reached her South Point flat, she found herself illegally locked out – with no clothes, no food and nowhere to sleep. 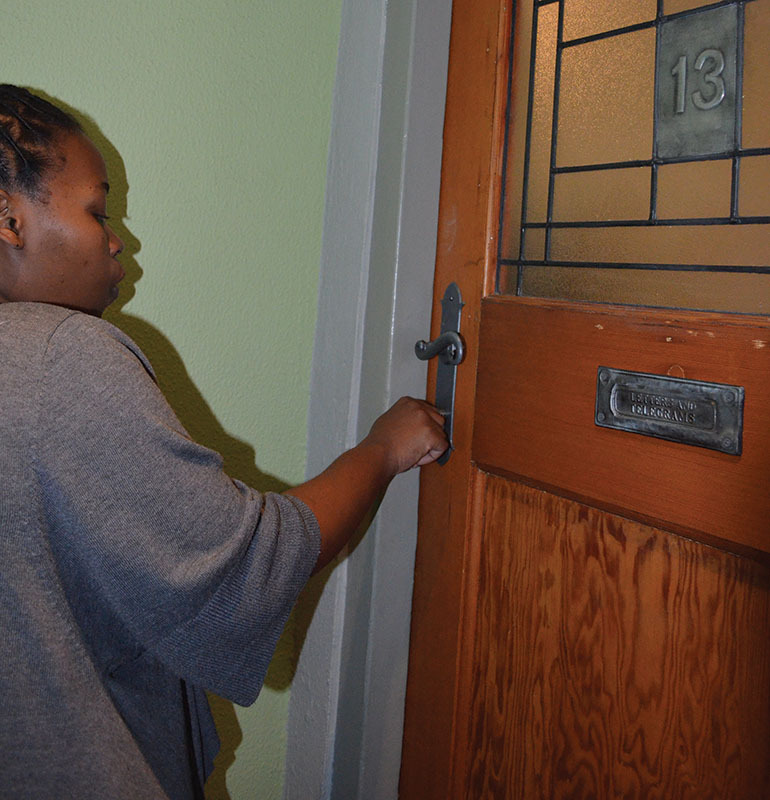 The Peppermint House resident and fourth year LLB student at UJ was locked out of her flat in April – with no warning. She is not the only one. Lebohang Motaung, 3rd year BSc Chemistry, heard his lock being changed while he was in his Norvic room. He was lucky though. He was able to persuade admin staff to return his key – but only after an angry exchange of words. Seabela found herself in a worse, and certainly more dangerous situation. When she reached her flat, she thought the key would work.She continued struggling with it, thinking she might have used excessive force and broken it. After calling around for a place she could stay for the night, she finally got a hold of her cousin, who put her up for the night in Pretoria. Motaung said he had seen students forced to sleep in their building foyers, after being locked out of their flats without notice. He was locked out because the administration claimed his roommate owed R8 000 – despite having only lived in the flat for a week, and having paid a deposit. Motaung said it was impossible a new tenant could owe so much money. And even if he did, Motaung could not understand why he was being made to pay for his roommate’s error. When Seabela went to South Point central the day after being locked out, she was told she was late on her January rent payment. She had not even been living in the flat in January. She had received an inflated statement at the end of March, stating that she owed R8 200. She said alarm bells should have gone off, but she just thought they had included the next month’s statement as well. “A statement doesn’t constitute a notice,” said a visibly upset Seabela. Former Van De Stel resident, Kelebogile Mothlomedi, said at her building they used to put up a list on the notice board of students in arrears. Lockouts like these were illegal because the landlord had not sought a court order to remove the tenants, she said. However, if tenants defaulted on payments, landlords had every right to evict them. Starosta said students could sue or lay a complaint with the Rental Housing Tribunal in town. Wits Vuvuzela approached South Point administration, but were told the responsible person was away on holiday and could not be reached for comment. This week we had no print edition of the paper, so we had to up our game online (well at least that was the plan going in). I was the lucky one who got to be online editor during this week. I was very excited to do so because online things tickle me. I got to run my first ever news conference which I must say I did quite well, delegating has always been a strong point of mine. Once that was done, I typed up the diary of the week – which set out who was doing what and when they were doing it for. I wouldn’t say that my deadlines where unrealistic, but I came to learn that they actually meant nothing to a lot of people. Some things came in two hours late and others two days late. I still rate I did what I could to make sure that the most important deadlines where adhered to. Our guest speaker for the week was Justice Malala, from 24 hour news channel eNCA. I opted to do something a little alternative this week when it came time to hand in our guest speaker report. 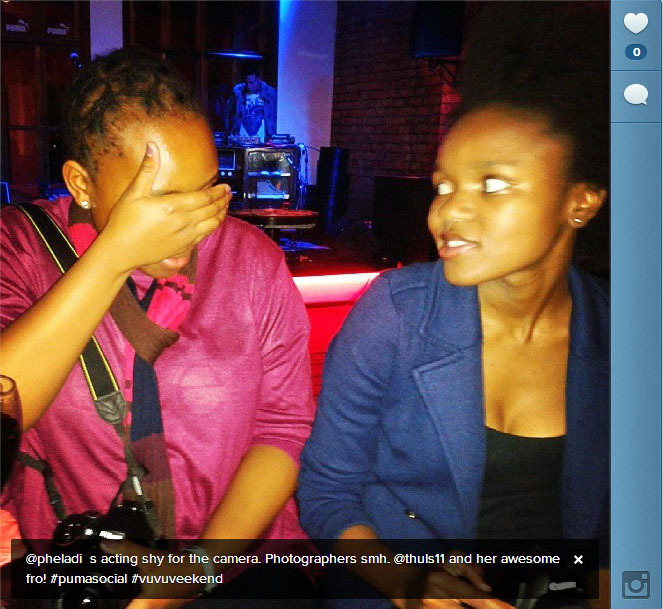 Right after he spoke to us we learnt about content curation via Storify. So I took it upon myself to incorporate what I had learnt and went the alternative route when writing up my report/article – I am not sure how well that went down with my lecturer though. I had so much fun with my test run on storify mission that I went ahead and put together another with a colleague later in the week. It is the ultimate stalker tool on the interwebs, I am slowly becoming a wee bit obsessed with it. We had a public holiday right in the middle of the week, that holiday was Worker’s Day. 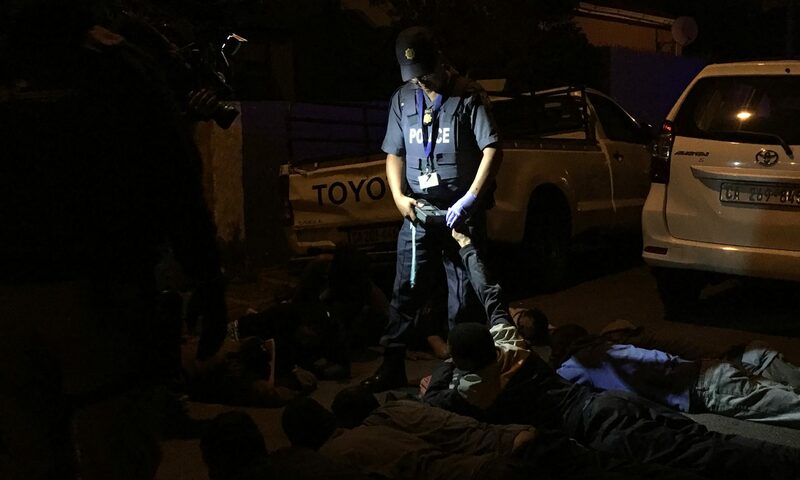 Vuvu journalist, Dineo Bendile wrote a great article on the day – she covered the staff at Wits who work nights to keep campus safe and clean. It made me realise how hard some people have to work and how little recognition these people get. Thursday and Friday were business as usual, which saw me running around asking people to submit their articles online. I went to a lecture/talk hosted by Eusebuis McKaiser on the importance of the intimacy required in student-staff relationships, to make them beneficial to the students. I must admit I am a fan of his and tend to agree with a lot of things he has to say, that said he made some great points. I also had a lot of fun putting together and just watching the daily video vox’s on our site, it is always a treat to get to hear other student’s thoughts and opinions on current issues. Which is another reason I had a blast being the editor this week. So all in all I had a great week, busy but quite chilled (hence the .5 numbering in my title) in comparison to what is coming our way this week. 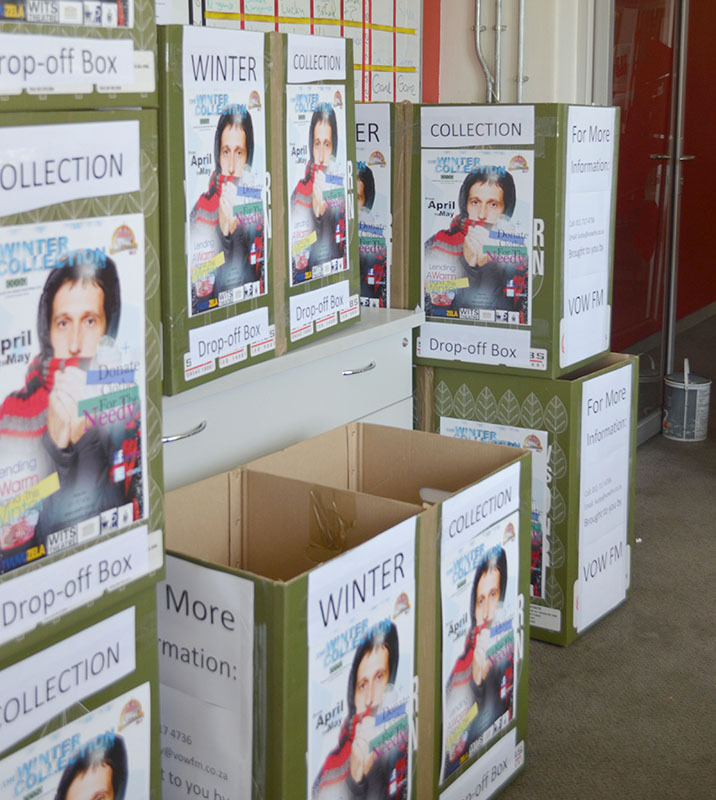 The chill in the air over the past weeks signals the onset of winter – and also the start of the annual Voice of Wits Winter Collection drive. VoW aims to collect clothing and anything else that will keep people warm in winter. These items will be donated to those in need, according to marketing manager Lucky Mdaweni. He asked that people wash their clothing before dropping them in one of the branded boxes placed around campus. Boxes can be found in various strategic spots, including residences. “We will distribute the items we collect to people in the Braamfontein area, as it is the community that supports the radio station,” said Mdaweni. Wits Students in need would also benefit from the drive. VoW had a partnership with the Wits Volunteer Programme, which would distribute clothing to students on an anonymous basis, said Mdaweni.